So “Let’s Talk About Lyme”… | Bite Me. The “Let’s Talk About Lyme” awareness event was a huge success, and there was standing room only in the Community center! I met so many incredible patients, physicians and community members, although it was hard to move around the packed house (no complaints!). I learned so much from the incredible speakers, particularly Gwen Barlee’s detailed presentation on the Lyme disease situation in Canada, and the other Lyme patients & families whose powerful stories touched the audience and brought home why we were all there. 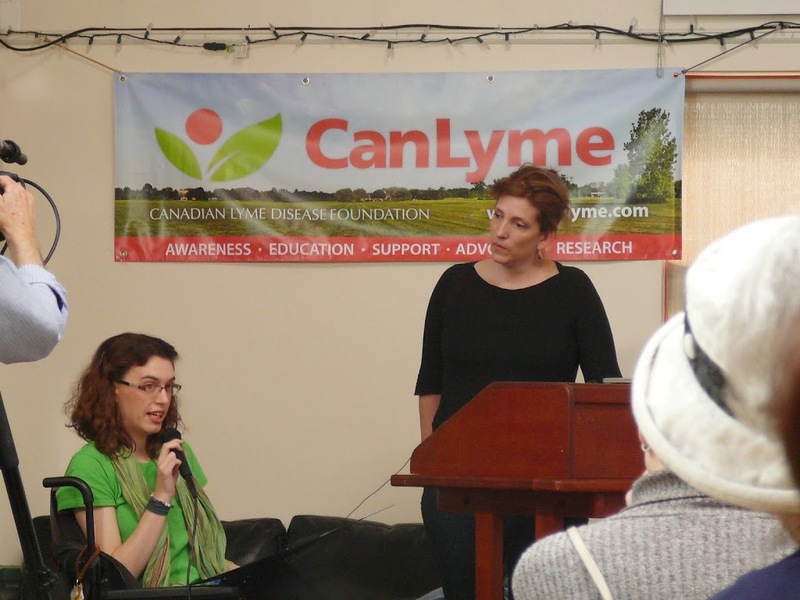 It’s hard to get that many people with chronic illnesses in one place, so Lyme disease awareness events are usually have a ‘family reunion’ feel to them :). “Let’s Talk About Lyme” May 10, 2014 @ Fairfield Community Center Welcome everyone. My name is Nicole Bottles, and I’m 21. When I became mysteriously ill at 15, I imagined I would keep going to specialists, peeling back layers of symptoms, until they discovered what was wrong, and I’d get back to my ‘usual’ life; Dr. House style. That was 7 years ago, and I still am waiting for a diagnosis in Canada. After going downhill daily, in 2008 we turned to our southern neighbors for help and saved my life. I learned I not only had Lyme disease, but 3 other life-threatening tick-borne infections. 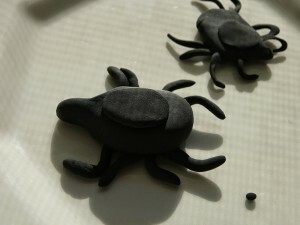 giant clay ticks to make with kids! I was a hobbit on an epic quest; to regain my health, of course, but also to ensure no one else suffer from what should have been a simple infection, curable in it’s early stages with $100 of antibiotics. An infection which in it’s late stages has no cure. Instead we have spent tens-of-thousands of dollars on my on-going treatment. I’ve made great progress with my treatment, but still have a long way to go. As a young girl, I’d always wanted to ‘change the world’, but I had no idea how. I decided to embrace this opportunity in disguise, and “make lyme-aid”. That means educating, and advocating for change, without letting a chronic illness keep me from experiencing all life’s wonderfulness. For 2 weeks we discussed challenges Lyme patient’s experience with 80 MP’s & Senators in Ottawa. It opened my eyes to the power of legislation, compassion and human connection. Many already knew about Lyme disease, and all quickly understood the gravity of our situation and wanted to help. Since becoming ill, I’ve wanted to give back to organizations that have helped me immensely. Channeling my passion for creativity, I’ve been able to financially support the incredible work of CanLyme & the Dr. Murakami Center for Lyme by knitting IV covers and creating original photography cards. On difficult days, I remind myself “to dwell in possibility”, as Emily Dickinson wrote. On the good ones, I keep moving forward, optimistic that if we believe we have the power to create change, it will happen. (STAND) So “Let’s Talk About Lyme”. Let’s spread the facts. Let’s engage our politicians. Let’s keep talking to our doctors. Let’s keep the conversation alive. Because the conversation can only stop when Lyme disease is cured, and prevention becomes second nature to all Canadians. ~ *rolls off of pillbox* I am so lucky to have the support and love of friends. I could never thank them enough! One of my best friends, Morri, came to the event and later created this amazing video, sharing what she learned (omg. the gal is a sponge! such accurate information too! high five! ), and also how to create a fabulous “Lyme-Look” eyeshadow. So cool. Check it out the video on her Youtube Channel!